Between 2016 and 2018, within the framework of an EU-led initiative, ten countries decided to set up a National Information Platform for Nutrition. Lessons learnt from the experience of these countries could be of interest to others considering the adoption of a similar approach, especially those among the more than 60 member countries of the Scaling Up Nutrition (SUN) Movement, which are already committed to the development of an evidence-based multisectoral approach to improving nutrition. A mid-term review of the EU-led NIPN initiative carried out in 2018 provided valuable insights and recommendations which have been incorporated into this guidance note. 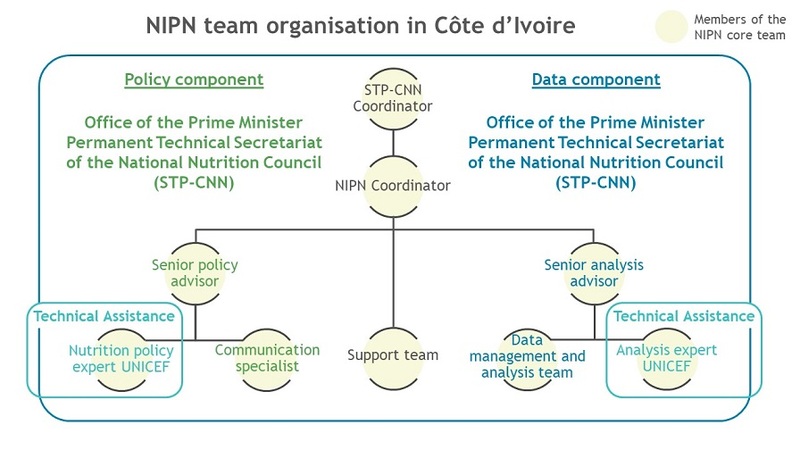 One of the core principles of the NIPN approach is that it builds on existing structures, institutions and processes and adds value to existing initiatives by compiling existing information from multiple sectors and producing in-house data analysis in response to a country’s needs and demand. When planning to set up a NIPN in a country, a number of pre-existing conditions are thus critical to consider, as they influence the longer-term sustainability of the platform. Existing government and stakeholders’ dynamic around multisectoral approaches to nutrition, reflected by the existence of a multisectoral nutrition strategy, plan and coordination structure. Demand for a strengthened information system, and better use of available data and information at (sub-)national level, even if currently underutilised (a first light assessment might be useful – additional guidance on how to conduct a data landscape exercise is provided in section 3.1). Presence of other data initiatives in country in order to establish what the added value of a NIPN could be and to avoid duplication of efforts. A scoping exercise can be useful for assessing the pre-existing conditions for a NIPN (see text box below). Pre-existing conditions can be initially assessed in a scoping mission through a combination of desk review, individual interviews with key stakeholders and focus group discussions. Documents to be reviewed include: national development strategy and plan, sectoral strategy and policy documents and action plans, specific nutrition-relevant programme documents, stakeholder mappings and online data portals. Key organizations to consult include: inter-ministerial coordination bodies for nutrition; ministries relevant to nutrition (e.g. health, agriculture, water and sanitation, education, planning and finance, social welfare and protection); the national statistics office, academic institutions and other institutions providing data analysis capacity to government departments; main donors, UN agencies and civil society organizations in country. The objective and added value of a NIPN might not be immediately obvious to all partners, stakeholders and sectors. From the start, it is imperative to present the added value of a NIPN, which aims to strengthen ongoing initiatives (e.g. tracking progress of the country’s Multisectoral Nutrition Plan of Action), is embedded in existing local structures, and is complementary to support provided by others in the SUN Movement. The added value and feasibility of a NIPN needs to be clarified with the stakeholders at the political level as well as the technical level. At the technical level, there are several organizations involved bringing a diverse set of expertise related to policy development and data analysis. At the political level, decision makers are involved who represent various sectors and line ministries as well as those who represent higher decision making levels such as the Prime Minister’s Office or President’s Office. In order to overcome challenges related to collaboration and joint accountability, it is of utmost importance to build a sense of common understanding and common objectives, and shared ownership and shared benefit amongst all participating sector ministries and sub-national institutions. to communicate actionable recommendations for policy decisions. Continuous advocacy and awareness raising efforts are therefore needed, in combination with the delivery of relevant outputs, to establish NIPN credibility and authority. Rather than being an ad hoc, one-time activity, this requires careful planning, seizing strategic windows of opportunity, using multiple communication channels (individual meetings, group discussions, workshops, presentations at high-level events), as well as repetition of a few, carefully formulated key messages. Why is a multisectoral approach to nutrition required? Why should data analysis guide policy, programme and budget decisions? 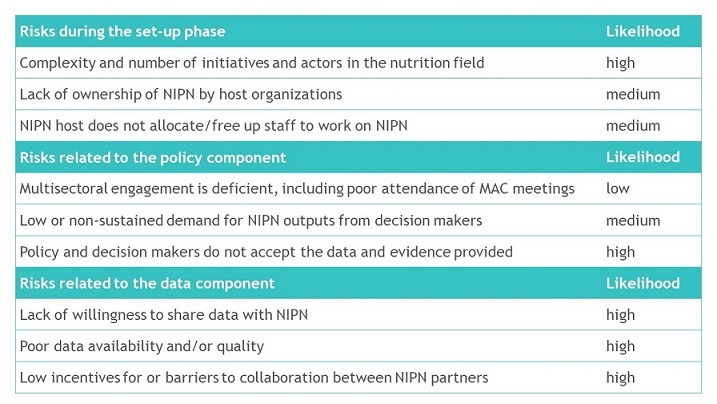 What is the NIPN approach and how does it complement existing multisectoral nutrition structures and approaches as well as other nutrition data related initiatives? Why should my sector/department/ministry be concerned with NIPN? The second presentation focuses on the need for data analysis to inform policy decisions and explains what NIPN is. Setting up a NIPN is a collaborative process. The time necessary for consultation and consensus building should not be underestimated: it is important to take sufficient time to hold meetings, formulate and adapt the description of the approach, and establish a shared vision between the multiple institutions involved. When country processes are participatory and thorough, the final set-up is more likely to have the full buy-in and commitment of all stakeholders. This process may require external facilitation and resourcing. The idea behind the NIPN is not to create a new organization, but to embed the various NIPN functions within existing organizations while strengthening their capacity to fulfil these functions. While acknowledging that there are many time and capacity restraints, it is recommended that staff of the NIPN host organizations are enabled to take on NIPN tasks as part of their normal way of working, and the number of staff hired on the project budget should be limited (this section, page 8). Communicating and disseminating the findings to policy makers. The policy and data components of a NIPN are supported by a Multisectoral Advisory Committee (MAC), which at country level may be called a ‘Steering Committee’ or ‘Policy Advisory Committee’ (section 1.2). Multiple organizations with different strengths may thus be involved in NIPN and suitable institutional arrangements need to be put in place to ensure effective and efficient collaboration. A careful choice of institutions is key to reduce the risk of competition or lack of coordination. Formalising the institutional arrangements which are adopted for the NIPN (for example in a contract or a Memorandum of Understanding) will help to clearly define roles, responsibilities and accountability mechanisms, and as such avoid a lack of coordination and the duplication of efforts. 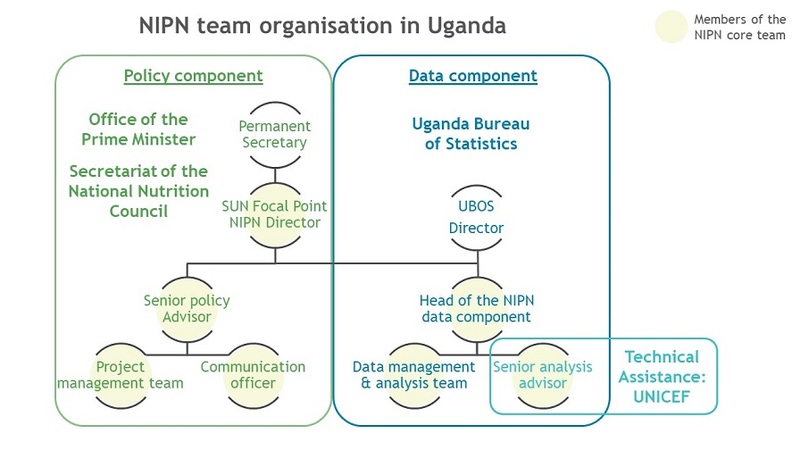 Other stakeholders, such as sectoral ministries, academic institutions or international organizations, including SUN networks, will provide support in the sub-steps of the NIPN operational cycle to ensure policy relevance of the questions and to contribute to data analyses and capacity development of NIPN actors. Building on existing structures with high-level political support and an organization with nutrition coordination authority, that is in demand of strategic information, leading the policy component is relevant to the success of NIPN projects. Often the mandate or responsibility for nutrition is spread over a number of institutions, which makes strong coordination and a cross-sectoral mandate even more important. In numerous countries, the main coordinating body for nutrition activities is housed in an institution with cross-sectoral mandates, such as the Office of the President or the Prime Minister, a National Nutrition Council or a Ministry of Planning and Development. 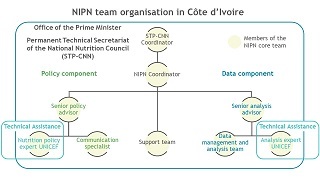 The importance of the NIPN strategic lead institution having a specific mandate for multisectoral nutrition coordination is especially evident where it translates into a higher degree of ownership of the NIPN operational cycle of questions, analysis and communication of findings. High-level political support is necessary, but can also become a risk when political leadership changes. Yet political will and country ownership go hand in hand, and country ownership is one of the core principles of NIPN. Continuous advocacy and awareness raising of multisectoral nutrition and the role of NIPN is necessary to establish support across a broad political platform. 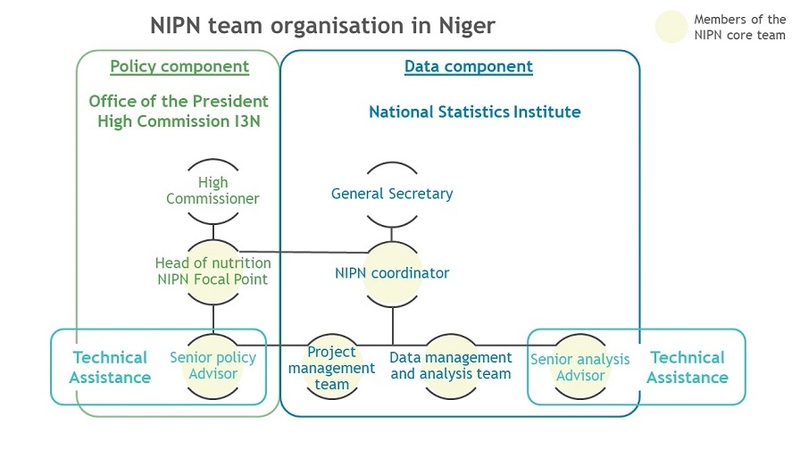 The data component of the NIPN might be best hosted by an agency which already has a mandate and the capacity for data management and/or analysis, if possible with a cross-sectoral mandate. 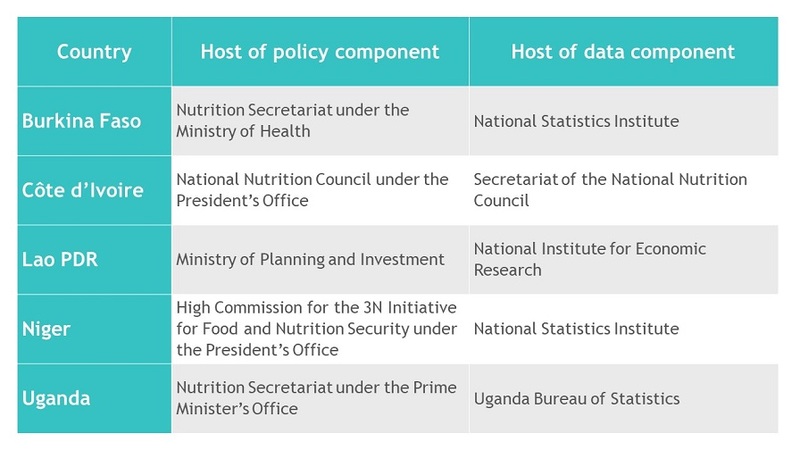 Statistics agencies, as well as planning agencies, are potential government units for capacity building in the analysis of nutrition-related data, so that this becomes part of the routine work of these institutions. It is key to identify an agency that has a mandate for socio-economic analyses, is geared towards responsive analysis using multiple data sources, has some convening power, and has the ability to access data of other data providers. Statistics bodies do not necessarily all have a mandate of socio-economic analysis, and in some cases their mandate is limited to data collection and management and does not include analysis and influencing. They are not equipped to undertake nimble work to answer current ad hoc questions that require answers in time for policy and programme decisions. The first step is to have the teams in place, as without the ‘hands and feet’ of the initiative, no action or implementation is possible. 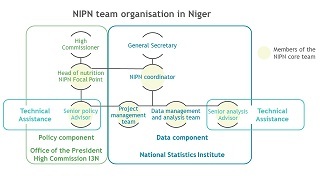 A wide range of expertise is needed to implement a NIPN: policy development and analysis; socio-economic analysis; public health nutrition; data management; statistical analysis; convening, negotiation and facilitation; knowledge management and learning; and administrative and financial management. As much as possible, existing staff of the NIPN host organizations must have time freed up to take on NIPN tasks as part of their job description, enabled by project allowances. In addition, a number of project-based positions may need to be created in order to ensure efficient implementation. This may especially be true for the coordination and management role. Strong leadership and coordination is required to ensure the various host organizations implement the NIPN approach in an efficient and timely manner, with appropriate sequencing of activities and a clear division of roles and responsibilities between the various host institutions and individuals involved. In some countries, a high-level individual may be appointed to lead a NIPN, but in practice this person will be too busy to take care of the day-to-day management of a NIPN. This role then needs to be delegated to another project officer who has been appointed to this effect, such as a NIPN coordinator. In general, NIPN implementation requires a full-time coordinator who is responsible for monitoring progress and who will hold the other NIPN actors accountable for the delivery of activities as per the work plan. She or he will also be responsible for continuous risk assessment and the development of a mitigation plan. Part-time support provided to the coordinator could include administrative assistance, financial management and communications. 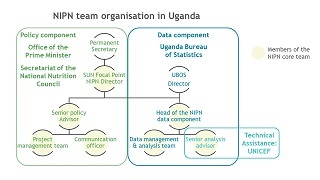 Examples of a NIPN team organogram is provided below. In the initial stage of setting up a NIPN, there is a strong need to strengthen the capacity of institutions and individuals to implement the NIPN operational cycle. Specific modalities and dedicated resources for strengthening existing capacity need to be defined. Guidance on how to assess capacity gaps and develop a specific NIPN capacity building plan is provided in section 1.3. One of the modalities for strengthening capacity is the recruitment of full-time or part-time technical assistants embedded within NIPN policy and/or data components. Each country requires dedicated investment for setting up a NIPN, therefore specific financial resources to support this process must be identified. A detailed budget should be prepared and agreed by the partner organizations. In the framework of the EU-led NIPN initiative, ten countries benefit from financial support from the European Union, the UK Department for International Development and the Bill & Melinda Gates Foundation. A typical NIPN budget for these countries was around 3 million euros for a three to four year period, to support project staff, advocacy and awareness raising, capacity building, hardware and software investments, as well as technical assistance at country level. The donors have also funded a Global Support Facility providing technical support to all ten countries. As with any new approach, there are multiple risks at the technical, political, and process level, that may impede or delay the successful implementation of the NIPN, and ultimately its impact on improved nutrition policy, programme and investment decision making. While it is important to assess the potential risks and their likelihood during the planning phase, and to define sound mitigation measures, it is equally important to put in place a robust mechanism for ongoing joint risk assessment and active mitigation between partners during NIPN implementation to avoid delays and ensure progress as planned. The likelihood of risks materialising may vary greatly from one country to another. It is important to carry out a realistic assessment of the weight of each risk and of the measures that can be put in place to reduce such risks. The table below provides examples of the risks that have been identified during the mid-term review of the EU-funded NIPN initiative. The early months of NIPN are critical for building relationships with sector ministries, solving institutional and technical issues and developing work plans. A fundamental first step is to develop of an initial, realistic and detailed work plan for all partner organisations combined, which takes potential risks and delays into account. A detailed work plan will contain for each detailed activity, a set of milestones, deliverables, resources required, and performance indicators to measure progress of each activity. The implementation of the work plan must be managed and monitored by the coordinator, who may also have to hold individual staff or organisations accountable for their performance. Progress is to be continuously monitored (on a monthly basis) against the proposed work plan, milestones, deliverables, indicators and budget plan, using adequate monitoring tools. Delays or changes in the plan need to be discussed with regard to the consequences for the deliverables of NIPN and to agree possible mitigation measures. Monthly progress monitoring calls are an excellent tool to hold all NIPN actors accountable for their respective deliverables, roles and responsibilities. A project Steering Committee, or in its absence the Multisectoral Advisory Committee, may play a role in support of the NIPN coordinator by reviewing NIPN progress on a regular basis, analyse the causes of potential delays or blockages, make decisions on how to overcome any major difficulties encountered, assess emerging risks and contribute to mitigation measure that would be needed, in line with the terms of the contract.